Are you suffering from forward head posture neck pain? You are in good company, as this is a growing problem in the modern tech-obsessed world. Doctors have been warning young people, who now account for the majority of cases seen clinically, for some time that they need to change their habits or face a future filled with potentially serious pain. Unfortunately, lifestyle choices and work demands have already crafted a generation of people who seem to be headed for postural disaster. Statistics show forward head positioning to be a rapidly growing phenomenon and with current trends, there is no reason to doubt its continuing propagation into the foreseeable future. This treatise provides fair warning to readers about the dangers of forward head positioning, also commonly called “readers neck”. We will also discuss exactly why the condition can suddenly become acutely and chronically painful. In the past, forward head positioning was primarily linked to actual skeletal problems, often affecting the spinal column, such as hyperkyphosis and certain types of torticollis. Alternate causative possibilities included some neuromuscular diseases. Clinicians also witnessed many cases in the elderly, due to osteoporosis and general feebleness of muscular ability. Occasionally, doctors saw a few cases involving teenagers with overall poor postural issues, which were easily corrected. However, now the average case of forward head posture is found among the general population of able-bodied young people. The current preoccupation with handheld electronic devices, coupled with the incredibly common incidence of sedentary work on a computer, has caused wide-spread growth of this problem to literal epidemic proportions. Add to this the tendency for these same young people to wear backpacks (often containing their favorite computer and electronic devices) and you have some real strong reasons why forward head positioning is spreading among today’s youth and young adults. Generally, forward head positioning is caused by a combination of postural habit, as well as imbalances in antagonistic muscle groupings that develop due to these bad postural habits. Of course, there remain other potential causes of forward head posture, as always, but these factors are easily identified and addressed using traditional care practices. The universal characteristic of forward head positioning is a less-than ideal bodily aesthetic with the neck protruding outward from the body, rather than centered above the torso. Often the chin also protrudes, further deteriorating the posture and making the condition that much more pronounced. Symptomatically, neck and upper back tension are almost universally expressed. Most patients report long periods of progressive tightness in the neck and shoulders prior to experiencing actual acute pain. When pain does occur, it often comes on suddenly and can range from dull burning discomfort to sharp stabbing torture in between the shoulder blades, into the arms and up to the base of the skull. Headaches often accompany or alternate with neck or upper back pain, as might tingling and/or numbness in the hands or elbows, unilaterally or bilaterally. Patients with very severe cases might report hearing or vision abnormalities, as well as dizziness or vertigo. Nauseous headaches add to the mix of possible symptoms, as does a sore throat in some cases. 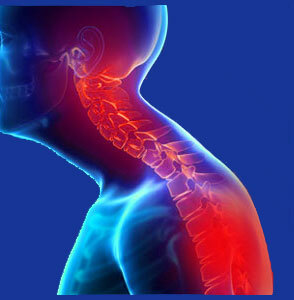 A minority of patients report neck pain when swallowing. First, to cope with immediate symptoms, we recommend avoiding drug treatment in favor of natural care methods. Some people find chiropractic adjustments to work well, while others find that manual manipulation makes things much worse. Most patients report relief using ice of the first 48 hours, followed by wet heat thereafter. Combining these natural remedies with massage, even self-massage, is very effective to provide relief. Acupuncture might also help take the edge of acute presentations of pain. Next, the underlying cause of postural abnormality must be addressed. This will take time, effort and professional assistance. You will need to formulate a program of stretches and exercises with your doctor or physical therapist to reverse the damage you have already done to the neck and upper back tissues. These proactive measures will correct antagonistic muscle set imbalances and strengthen weak tissues in the dorsal anatomy, while bringing the overly tight tissues in the anterior anatomy back into balance. Forward head posture did not occur overnight, nor will the cure work in a short timeline. In fact, most patients will have to maintain their exercise for life in order to stay healthy and prevent recurrence of pain and postural problems. We remind you to always remember the importance of your psychoemotional health when it comes to muscle pain and postural disorders. One of the major contributors to this condition is the internal tension that we all carry, trying to express itself while we work or play on our devices. Since media electronics certainly serve as a distraction for most of us, it is not a stretch of logic to warn that the very issues we are seeking distraction from are those which contribute to the tension, driving forward head posture presentations almost universally. To rectify the psychological issues causing these imperatives, we recommend learning more about knowledge therapy as an alternative cure for neck pain.